Please enjoy Wolverine on a jet ski, a moment I missed entirely, perhaps because I wasn't paying a lot of attention to kids' TV at that time. I don't remember most of these commercials, actually, even though I watched every episode of the show as it aired. I'm assuming the FCC regulation against toy ads airing during the shows they spin off from was still in effect. 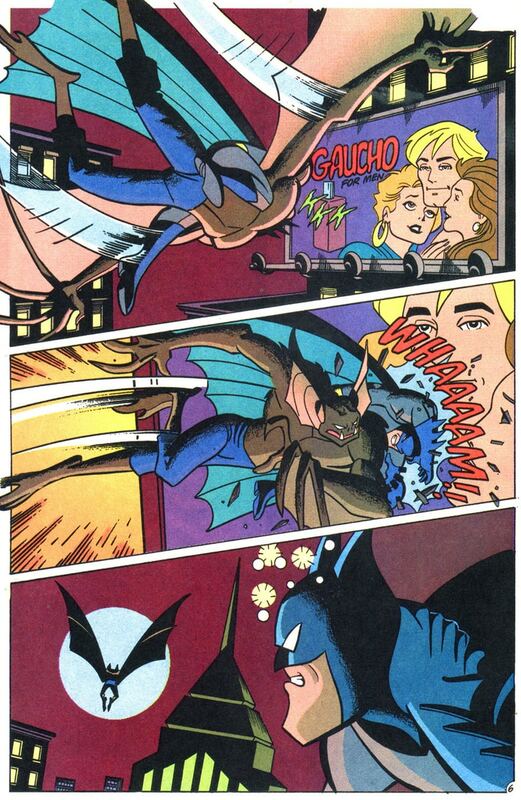 Also, I'd be curious to know why Wolverine's look during "Inferno" inspired that Missile Flyer toy. What is that thing? 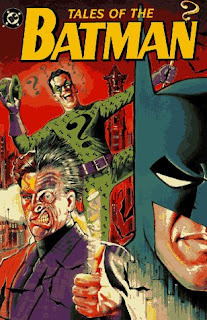 Finally, here's an interesting collection of animated Batman commercials from the late 1980s, which apparently only aired in Canada. 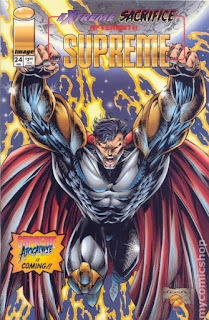 They used Mike Zeck art as the inspiration! 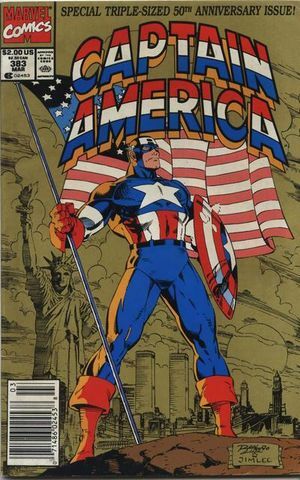 CAPTAIN AMERICA #375 - No double-sized anniversary here. Witness the scourge of drug trade menaces Jerkweed and Ground Chuck. Also witness Captain America steal a plate of spaghetti from the Kingpin while resisting Typhoid’s subtle advances. Gru is writing Cap as an utterly delusional zealot who’s going to violently take down the drug trade singlehandedly. 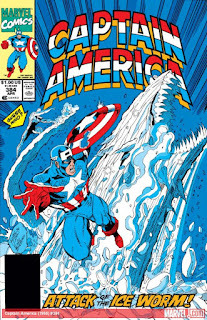 The story’s explanation is that Cap was unwittingly exposed to Ice, so now he’s hopped up on the junk he’s trying to stop. I assume Gru was going for something deeper; Cap reads as a parody of every anti-drug action hero of the era. When someone mentions societal issues that might lead someone to turn to drugs, Cap shuts down that hippie talk. 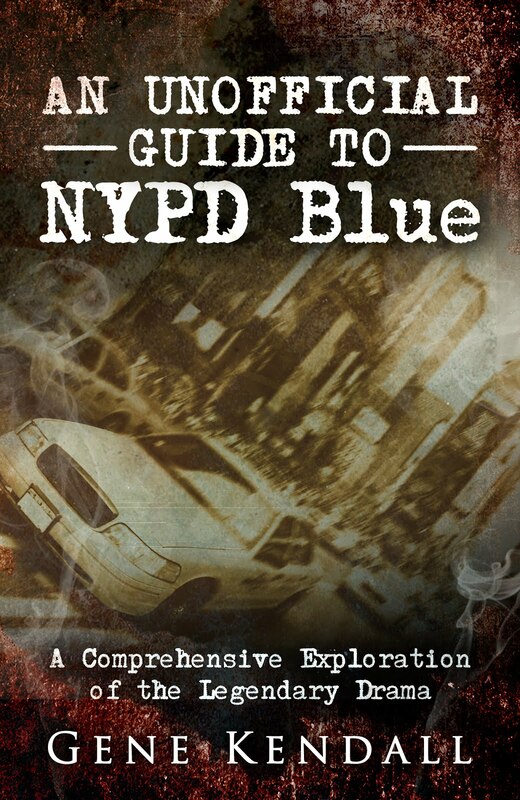 So Gru’s writing an action-packed anti-drug story…as a response to action-packed anti-drug stories? Is there a variation of this expression that I’m not aware of? 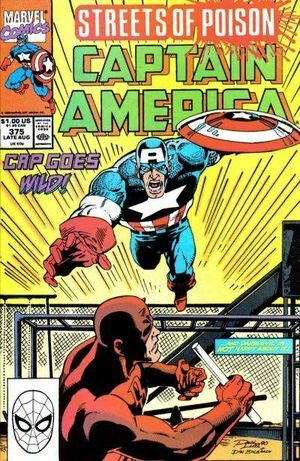 CAPTAIN AMERICA #376 - The Red Skull returns for his 495th shadowy scheme. The Spirit’s “I’m not on drugs!” catchphrase from his movie never caught on. Can Cap sell it this issue? 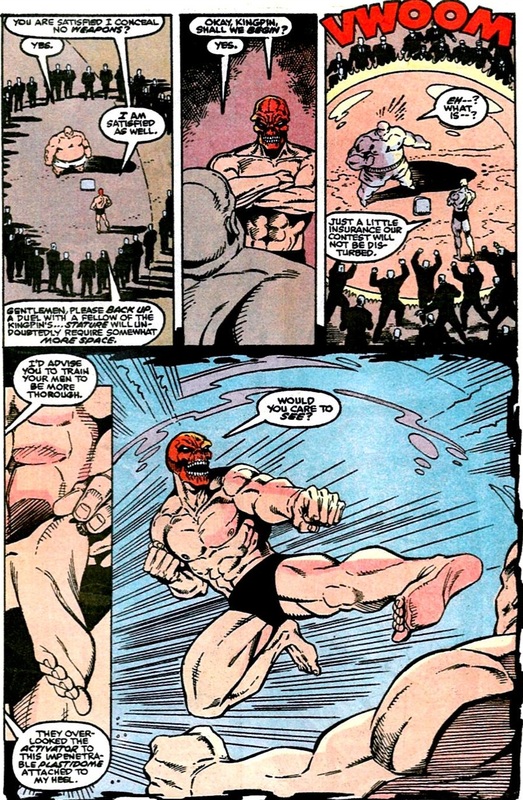 Apparently, it’s Daredevil’s fight with Crossbones that leads to him developing amnesia in his own book. Never made that connection before. Funny to think that Nocenti had Daredevil brainwashed into becoming a Marxist by a young bohemian -- while Gruenwald was doing this rather odd take on the War on Drugs with Cap. Marvel was very mainstream, but also quite strange during this era. The back-up has Battlestar facing a villain who’s grown so muscular, he needs a “hover-harness” to move. CAPTAIN AMERICA #377 - Bullseye vs. Crossbones is pretty great. Loved this fight as a kid. 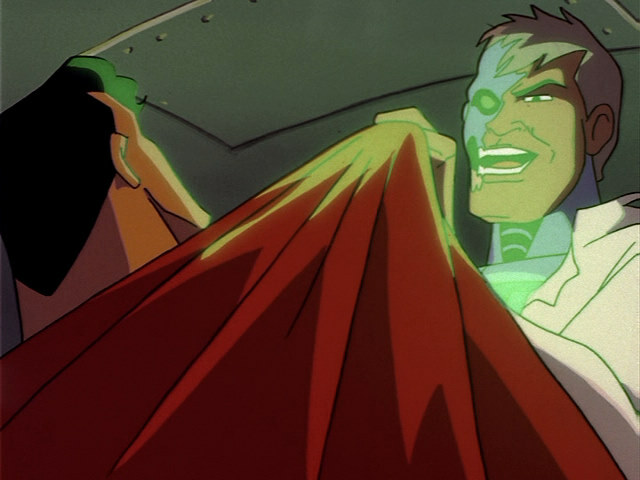 Hero guest spots are nice, but it’s also fun to see villains pop up in unexpected places. This is the issue that has Cap officially losing his Super Soldier Serum through a blood transfusion. During the operation, he hallucinates his origin story and remarks that the Dr. Erskine’s needle resembles a junkie’s. As ridiculous as this is, Gru does introduce an intriguing question -- what is Cap without the Super Soldier Serum? 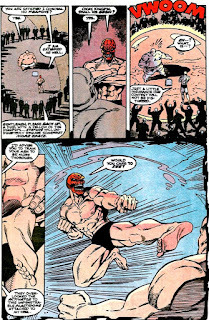 …but the real highlight is Kingpin and Red Skull wrestling in their underwear to determine who runs New York’s drug trade. Gru is working under the assumption that Cap will maintain his muscle tone after losing the Serum -- which enables him to battle Crossbones successfully and declare that he doesn’t need the Serum again. Gru thought it was important that Cap of all people “Just Say No” and not use the Serum as a crutch, but this doesn’t work. The muscle tone that Cap enjoys today exists because of the Serum. Even if he never takes it again… …and works to maintain his physique, Cap still has the physique BECAUSE of the Serum. The back-up story, meanwhile, has Battlestar happily accept “augmentation” to revive his super-strength. Clearly, Gru ran these stories simultaneously for a reason, but it also works to undermine his point. Are we to believe that Battlestar is “less” of a hero for accepting pseudoscience as the means of his strength? Or is the Powerbroker’s strength augmentation process somehow morally superior to Dr. Erskine’s treatment? If so, since Cap has suddenly developed a moral issue with the Serum, why wouldn’t he just go to the Powerbroker? 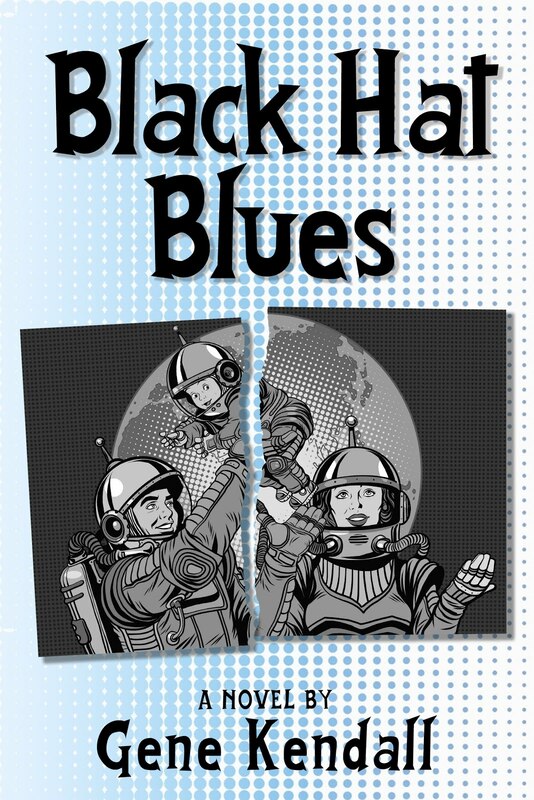 Meanwhile, in the backup, we learn that USAgent has changed his identity from Johnny Walker to…Jack Daniels. CAPTAIN AMERICA #379 - The rare issue that required a fill-in for Ron Lim. Introducing Nefarious, the blond version of Count Nefaria. Nefarious gained his powers through an experiment much like the one that granted Cap his powers …Gru is exploring the consequences of people so easily gaining powers through these experiments, presumably to emphasize just how heroic Cap is for rejecting the Serum today. I don’t personally buy it. I can see where Gru’s coming from, but dwelling on the moral implications on a fictional serum that has no side effects, and connecting it to steroids is just reaching for a moral quandary. CAPTAIN AMERICA #380 - More fun with the Serpent Society. 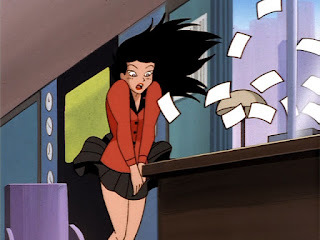 The Society refuses to believe that A) he’d ever touch supervillain trash like her, and B) that she hasn’t sold out their secrets.Diamondback is on trial, due to her relationship with Cap. I always loved the Serpent Society as a kid; just villainous snakes constantly turning on each other and endless in-fighting. Meanwhile, Cap’s reunited with his old girlfriend Bernie Rosenthal, written out by Gru years earlier. Bernie’s graduated law school since her last appearance, indicating old Marvel’s resistance to a stuck timeline. This means that students can graduate from school, couples become parents, and even (gasp!) Spider-Man grows up. The USAgent back-up stories are by Mark Bagley. He captures Agent’s barely restrained fury quite well. Gru was probably thinking about steroids even before Streets of Poison. 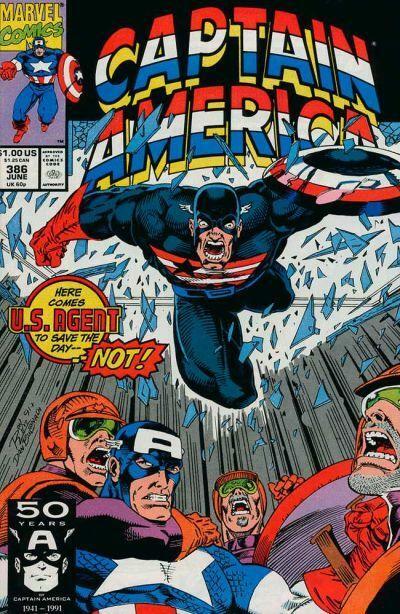 USAgent always seemed like a roided-out version of Steve Rogers to me. CAPTAIN AMERICA #381 - Paladin appears to creep things up. I’m going to assume that Paladin’s gimmick of constantly hitting on female heroes has been dropped by now -- lest Marvel tempt the wraith of The Dreaded Social Justice ThinkPiece That Might Eventually Lead to a Hashtag. Diamondback turns to Cap for help, but he can’t promise that he won’t arrest her two remaining friends in the Society. So, she hires Paladin instead, who keeps reminding her that he wants more than cash as his payment. The way Gru writes the Society continues to impress me. Most of its members are conflicted about turning on Diamondback -- but they’re also loyal to their leader, King Cobra, and believe that the Society is their only real shot in life. There’s real drama during the fight; it’s character vs. character instead of sadist vs. sadist. CAPTAIN AMERICA #382 - As much as I liked Lim’s CAP, that shield was occasionally off-model. 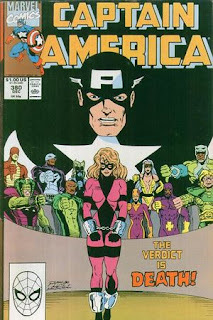 The Cap/Diamondback/Serpent Society arc ends, and I have to gripe about one dropped plot. Last issue, Diamondback was terrified that she’d killed Bushmaster by accidentally tossing the wrong diamond down his throat. This issue, Bushmaster is fine and the acid-bomb he ingested last issue is never mentioned. Disappointing. Even though Gru introduced the Society fifty issues prior, this is the first conclusive victory Cap’s had over them. 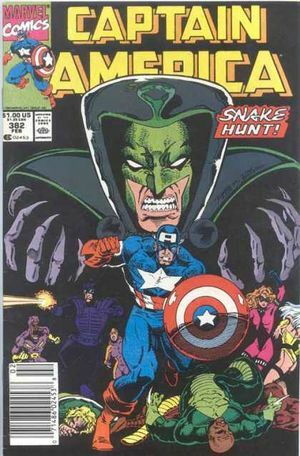 It’s a shame the Serpent Society never caught on. They would’ve suited most of Marvel’s “street level” heroes. Remember when the Circus of Crime kept popping up in the late 90s? Just imagine the Society getting some of those roles. 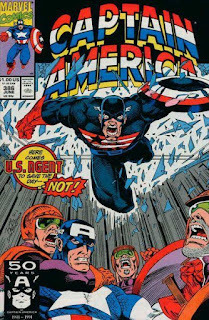 CAPTAIN AMERICA #383 - Cap officially enters the ‘90s. Although Gru is back to channeling Silver Age DC -- using Cap’s anniversary as an excuse for him to meet figures like Paul Bunyan and Johnny Appleseed. I’ll be honest; I’ve never liked this logo change. I realize it’s the classic logo to many people -- but I prefer the more solemn logo that doesn’t scream “comic book.” Think it fits the tone of Gru’s earlier issues well. Maybe the logo change is signaling an intentional change of direction? Less political intrigue and more high-adventure? CAPTAIN AMERICA #384 - Deceptive cover alert. Iceman is certainly not in this issue, although Jack Frost is rendered as his twin, right down to the briefs. Gru reveals this issue that Jack Frost was also frozen in the arctic at the end of WWII and is only now being revived. Jack’s frozen *again* during the climax, but Gru does throw some theories out regarding his origin -- and reveals that D-Man is *also* frozen up there in the cold. But the real significance of the issue is Gru simply giving up on the “Super Soldier Serum is a drug” plotline. Cap learns that there’s no way the Serum can truly leave his blood, so he’s stuck with it, regardless of his feelings. 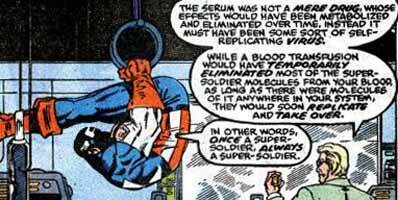 Cap shrugs his shoulders and declares that comparing the Serum to recreational drug use was kind of silly. The End. I wonder if Gru would’ve backtracked if he received as many letters criticizing his stance against Cap working as a commercial artist. The idea that Cap would have a deep moral conviction against drawing toothpaste ads always seemed ridiculous to me. CAPTAIN AMERICA #385 - The Watchdogs fight against that raunchy rap music of 1991. While one of Cap’s old neighbors joins the Watchdogs, Cap tries to reconcile his feelings for Bernie and Diamondback. I remember one of the letter pages from the Waid era questioning if CAP lends itself to these romantic subplots. 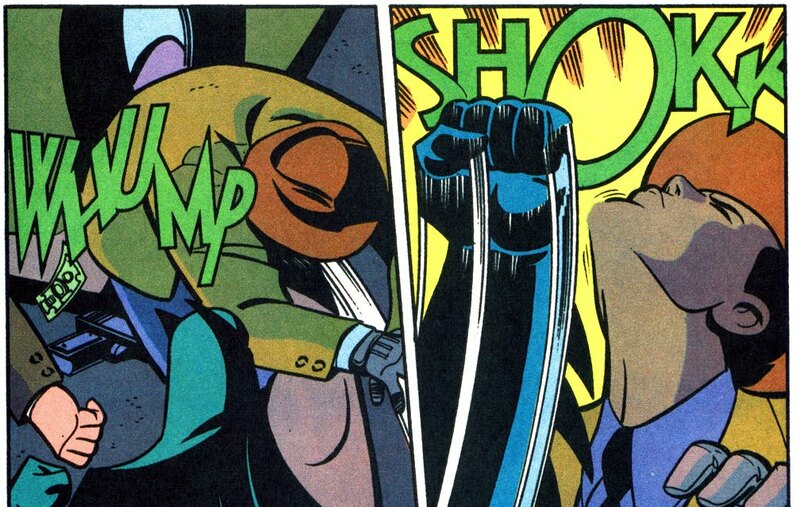 Waid’s Cap was very much an icon, the character everyone in the book stands in awe of. Gru tends to avoid this. Cap’s legendary status is occasionally given a nod, but Gru is more interested in writing Cap as a man. 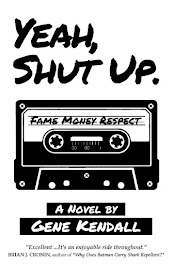 Diamondback stars in the back-up, creating Bad Girls, Inc. with two other Society members. It’s actually kind of amazing that Marvel didn’t publish a Bad Girls, Inc. comic circa 1995. CAPTAIN AMERICA #386 - Party on, USAgent. 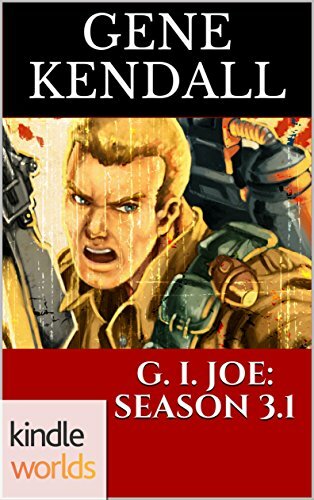 Given the grim tone of the original Watchdogs arc, I’m surprised that Gru’s writing this as a more traditional action arc. The early Watchdogs story seemed incredibly edgy to me as a kid; this one is much safer. The Watchdogs have gone from firebombing adult book stores to kidnapping artists and brainwashing them into loving mom, baseball, and the American flag. The Diamondback story has Dan Panosian penciling and inking, now in the style of regular back-up artist Mark Bagley. 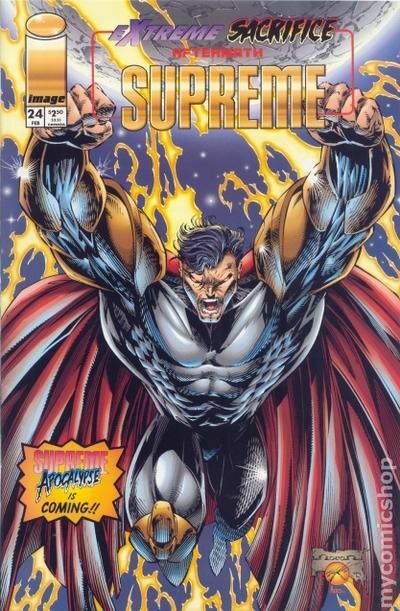 Unfortunately, it ends in a cliffhanger -- and it’s the last regular issue reprinted in the book. Next story is an unrelated annual story. I think these Epic collections are great, but I wonder who’s served by only printing single chapters of annual crossovers. 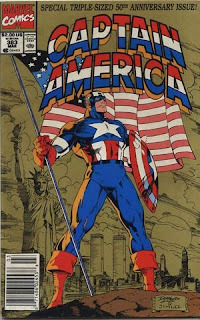 I’d much rather have four additional monthly CAPTAIN AMERICA issues in place of the two annuals.